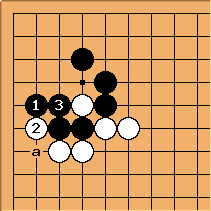 In 38 Basic Joseki this joseki is mentioned. This is the recommended continuation. 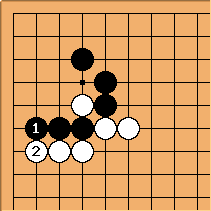 Black ends in gote, and a is a gote play for black. LukeNine45: I know this has nothing to do with your question, but can someone explain why this is joseki and not a big loss for white? Is there an invasion in the corner for later or something? Bill: This is locally advantageous for Black. Alex: In other words, it's a situational joseki, when the centre is important, or when White doesn't want Black to build a moyo on the top side, as would happen if White played the usual joseki move of at in the first diagram. pwaldron: To expand a little for LukeNine45, there is no corner invasion for white. 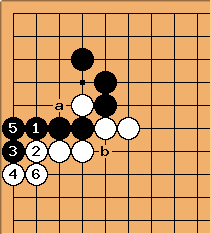 Black has more territory than white, but he has also played an extra move in the area. If you want to truly compare the position, you must include the extra move that white is owed. Perhaps that move might be an approach move in another corner, or a big move expanding a territory somewhere else. LukeNine45: Ah, I see. Thanks! Bill: But wait! There's more! because it allows this ( at ). But doesn't this prevent the problems with the bad continuation, leaving black with a better position than the recommended continuation? 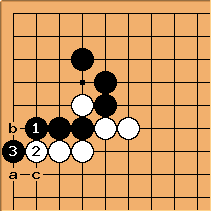 Black stille ends in gote, but gets slightly more territory, and the continuation a, b, c ends with black's sente. 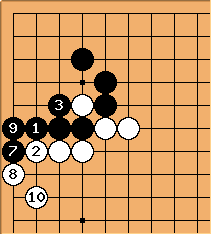 There is some aji in black's position, but it still seems that this makes the joseki favor black. Skylancer (11k): I'll take a shot at this one. Firstly a,b,c is not Black's sente. White at a captures Black stones. So Black needs to defend. Now, White has sente and it is as if Black played out a bunch of endgame moves way too early, strengthening White's outside area in exchange for only a couple points in the corner. This is a gain for White. 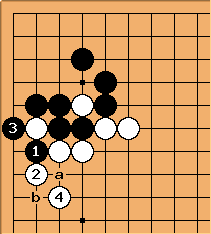 Now, for example, White can capture a Black cut at b independently of a ladder. There might have been a way for White take more of an advantage, this is what I found, and I think that it is enough to make this non-joseki for Black. Bill: , if played, is hardly gote. It threatens the cut at 'a' or possibly the clamp at 'b' or the 'peep' at . OC, Black has other plays against White's position. 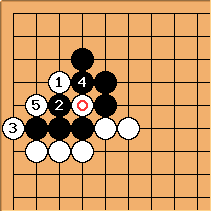 Bill: If Black does play as in the previous diagram, later - is sente-like (actually an ambiguous move, but it preserves the count). Bill: If Black does play the sagari at , is good. Later - is probably sente (depending on the right side). Comparing this diagram with the previous one, we see that Black is two points worse off with this one. It should be plain, now, that is inferior.